What makes us happy, and what makes our horse happy? It has often been a long, hard road for many of us to finally discover a piece of happiness. My piece of happiness is the discovery of positive reinforcement. I have subconsciously been longing for exactly this kind of communication with my horse for many years. Yet, it is always difficult to change oneself, to dare to risk trying something completely new, and I had to overcome many internal and external obstacles. After all, I have always yearned to discover the horses’ smile, and now I eventually arrived there. is the guiding principle of my work. have utmost priority for me. I have written so many books, articles for magazines, and blog posts but RPlus is a special and unique platform for me. It stands independently for itself, there are no publishers in the background, and it is not financed through advertisments. I created thist platform out of personal experience, and it will continously be filled with new material. With RPlus, I want to provide free space to share my thoughts, spread my knowledge, and discuss the important questions of life and learning with you. I have not been working for a year, and I have withdrawn from my professional life because I was diagnosed with breast cancer; Then I had to undergo therapy. This was a really hard time, however, there were also positive parts in all of that. For example, the feeling of having time, of having lots and lots of time. Even before undergoing chemotherapy I decided to see this a bit like an “extended summer holiday with certain limitations”. And basically, that was what happened. For the first time in the past decade, I had the feeling of experiencing sheer endless days. Time was not rushing any longer for me, like most adults think it is, but I was able to allow myself to focus on the small details of everyday life. I was able to enjoy doing nothing with my horses, and to consciously see the seasons pass. Until today, new ideas and visions for the future emerge out of this infinity that somehow felt like perfection; And many questions arise, many essential questions. This is where I am right now. In the books I have written so far I was always working on a certain topic, and I had to orient myself towards the taste of the masses. Basically, I collected and described much of the fundamental knowledge about horse behavior, and so I wrote about the current status quo in horse ethology, and positive reinforcement. Now I want to take this a step further. Initially, I wanted to finish my new book about clicker training before I became ill. This last year, however, made me understand that I do not want to write it the way I intended it to write. Clicker training is an important and essential part of my work. Distributing knowledge about this part was and still is very important for me. However, I have to start completely new to describe my own approach to the phenomenon horse; An approach that should eventually lead to the development of a fruitful and appreciating relationship and communication for both sides. Clicker training is only one piece of the puzzle, and there are many others. It requires a larger frame to be reasonably implemented within my philosophy of life. 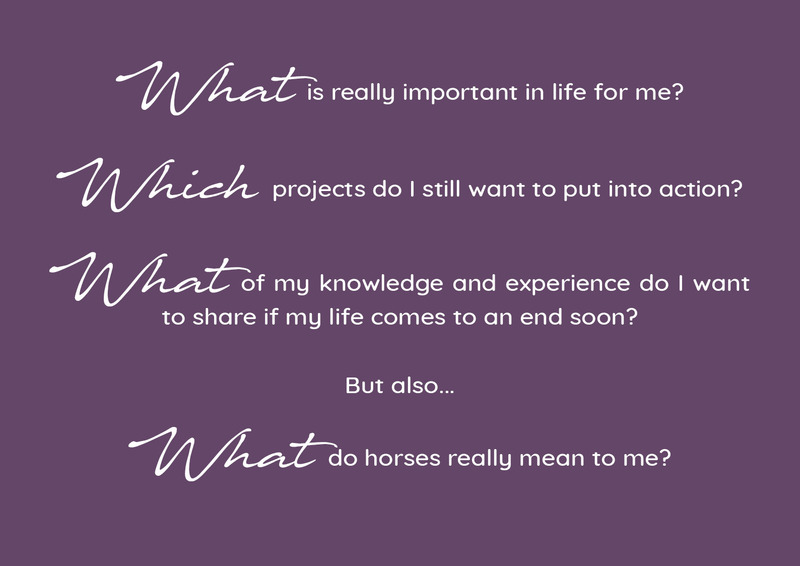 So, this platform is about my philosophy of life with horses, and about the practical details of my work as well as about the scientific background of learning theory. I have been searching all my life with my heart full of love for horses, and with my eyes wide open to discover the smile of the horses. I have been fascinated by these wonderful animals as long as I can remember, and I have felt naturally drawn to them since I was a small child. They provide so much joy and happiness for me, and I want to see them happy and content in return. I still remember an occurrence from my early childhood as if it were yesterday. It is one of my most detailed and oldest memories, and I can see it clearly with my mind’s eye: When I was a small girl of five years or so, I gave a carrot to Poldi, the incredbly vivacious pinto school horse. He was a shetland pony gelding, and I said to my first riding instructor, “Look, he is smiling” when I handed him the treat. But she simply replied, “Horses do not smile”. I was devastated, and could not understand why she had said that. Of course, I had no counter arguments then but still I was convinced that I was right. So, I spent many years observing in silence, keeping my “secret” of the smile of the horses so to not attract attention in the equestrian world that was steadily opening up to me. When I was a child I wanted to be with horses, and I was afraid of being marginalized for saying strange things. My childhood strategy definitely was to keep things to myself, and to follow the others in order to not lose having access to horses. It is sad but true that like then many people nowadays, among them even many so called experienced “horse experts”, do not look for the horses’ joy and happiness, and neither do they see their quiet suffering. What is more, even more human beings deny their own feelings of empathy. They seclude themselves from this suffering because they are driven by their own desire to be just like the others, to ride like all riders, to act just the way they know from role models in sports and entertainment, and to be just the way thousands of trainers and riding instructors worldwide teach them to be. Back than, even though I was only a little girl, I was quite certain on an intuitive level that my riding instructor’s careless words could not be true. I was not aware, however, of the far reaching consequences of this realization. I was certain in some way that horses have feelings just like human beings. Yet, I was less aware how much these feelings influence the actions and personality of horses just like in human beings, how much they govern the horses’ thinking, and how they are articulated in facial expressions and body language. We can detect clearly if a horse feels fine as soon as we are ready to take a closer look, and want to understand. We can see if it likes the soft touch of a hand or whether it enjoys the exuberance of playing together. 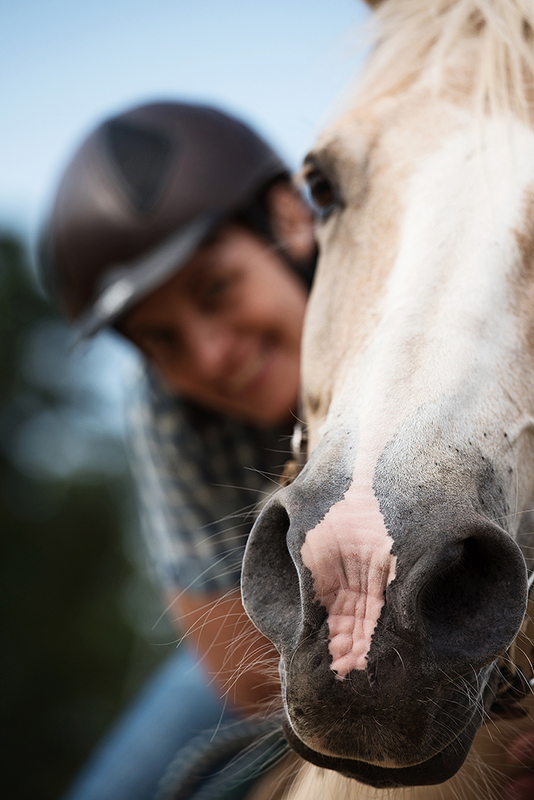 Horses do know how to smile or even how to laugh just the way we do. And they display a wide variety of positive facial expressions that sometimes convey content, other times joy or even enthusiasm. For this reason, I dedicate this platform to the vision of “the smile of the horses”. 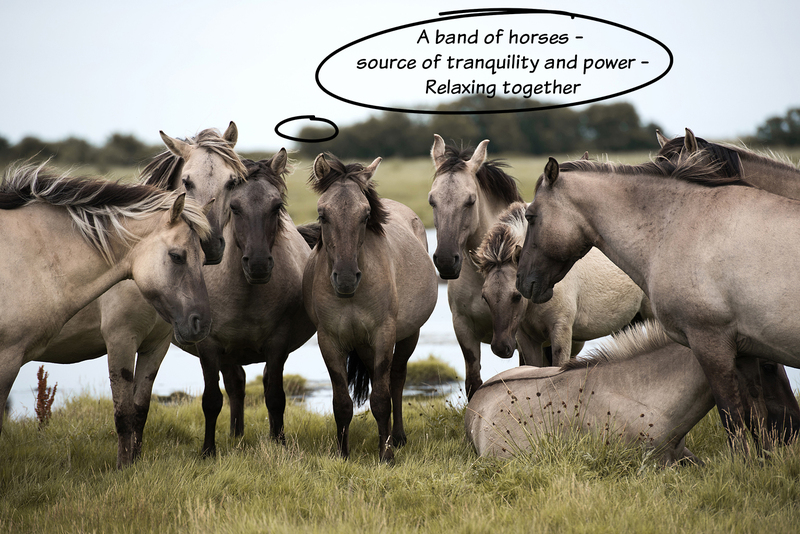 This basic idea forms the background almost like a mantra, and it describes what governs me in all that I do: Only the horses’ zest for life enables us to enjoy the happiness of being with these wonderful souls. 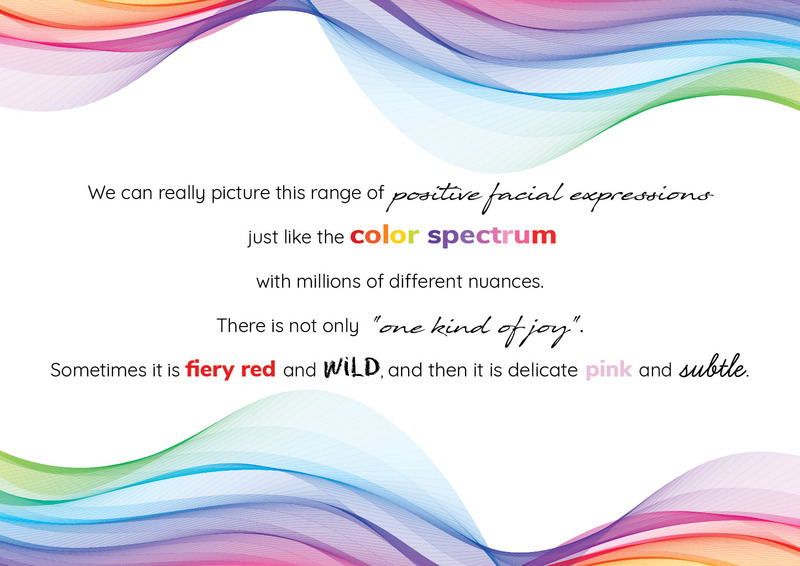 Like the colors of a rainbow, these different emotions add up to form a complete sensation, to form the unique color spectrum of each and every individual being. So, in every moment of being there can easily be a tiny bit of sadness in brightly colored joy; And these fine details and subtleties are worth discovering in order to truly understand and get to know a horse. 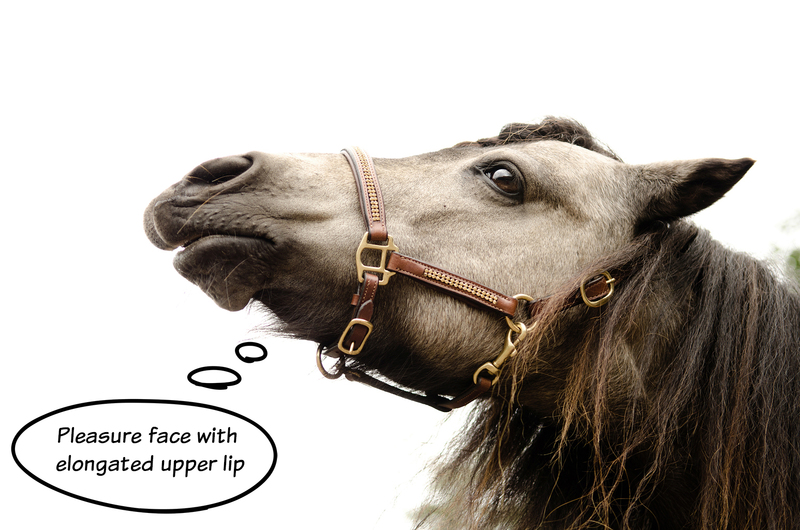 Zap through the diversity of equine facial expressions! 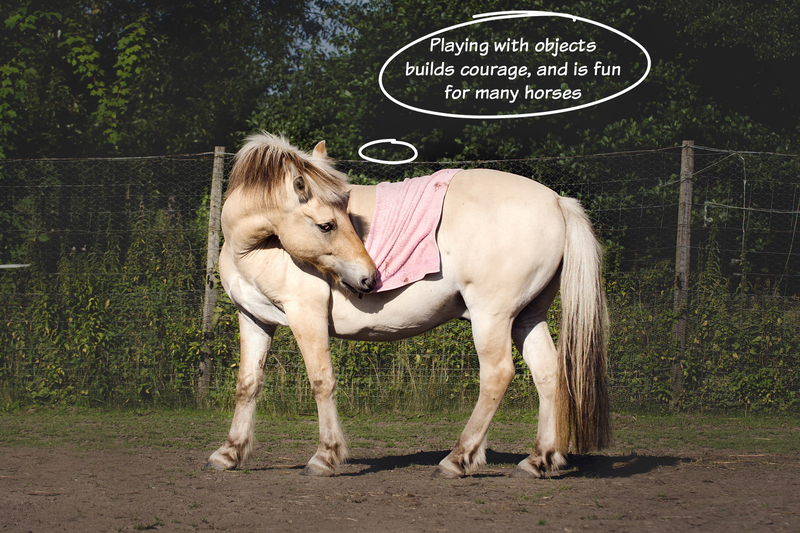 There is a vision of life I have developed rather early, it explicitly influences Rplus now, and I want to share it with the world: I want to show to others that horses too want to be happy, and that it is our task to especially design horse training in a way so that horses can experience joy. Yet, initially when I became self-employed, I hardly ever met a smiling horse, and at first I also did not meet human beings who were really interested in this topic. All through my childhood and adolescense, and later during the first years of work, most of the horses I met have not been happy; They did not have sparkling eyes, their personalities did not shine through, and their individual character was not present in their appearance. Wherever I turn, the horse world was and still is not about the horses themselves, and neither about their needs and desires but it is mostly about the rider’s well-being, and his or her goals and demands. Yet from my point of view, there can be no happiness for one part if the happiness of the other is inexistent, and we have to pay a high price if we always just are on the horses’ backs. Thus, I found unhappy horses in many stables, and I also found what appears to be a fair price for the intentional or unconscious abuse of horses; I found unhappy women, brutalized riding instructors and horse lovers that had given up and resigned. So, I needed to reach the humans in order to see the horses smile. I had to awaken their authentic feelings, their empathy, and their silenced dreams. After all, I believe that we can trace back all that involves our being together to this core principle. We want to be happy together. 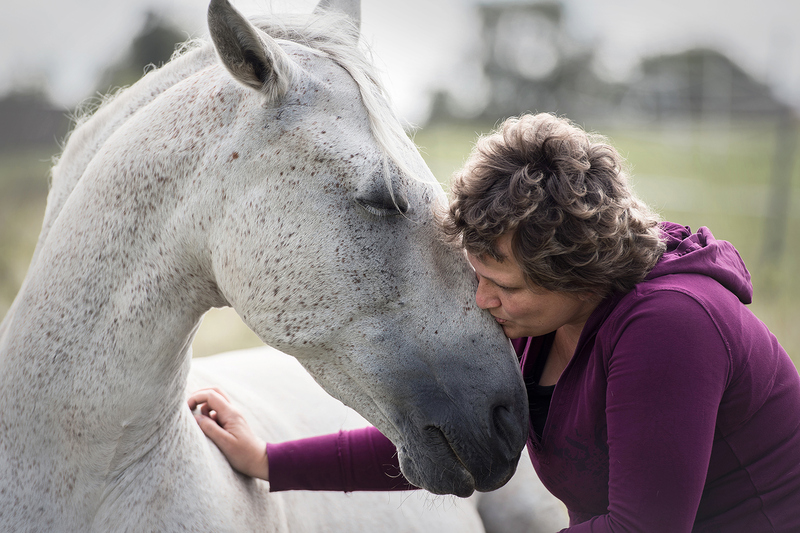 For this, it is so extremely important to discover who you really are so that you can perceive the other, your horse, as individual personality. Furthermore, it is inevitable to face your biggest worries, fears, and sorrows in life. These apparently negative emotions, your fear of loss, your daily suffering, in short, all the pains of life are inseparably linked with the joy of life. All these emotions that initially appear negative need a “stage” to be expressed and moments where they can happen. We can only learn to see the positive in life, and to let it shine if we perceive and lovingly embrace the dark sides of our selves. So, I started to look for possibilities to change something for the better of the horses many years ago when I was at an early stage of my professional carreer; And I found possibilities in my practical work. Horse keeping, feeding, and training are inseparably linked for me in order to see horses happy. 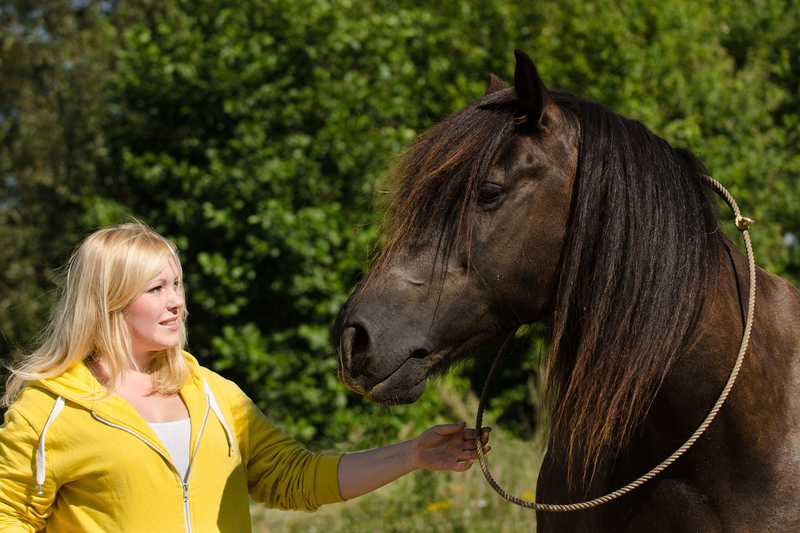 Horse keeping that resembles their nature, and a healthy diet have direct consequences on the horse’s psyche. What is more, for me training is not about being able to ride a specific exercise, to perform a stylish trick, or to show off my top athletic achievements. What really counts for me is the moment and being together. I want to emotionally touch the horses. 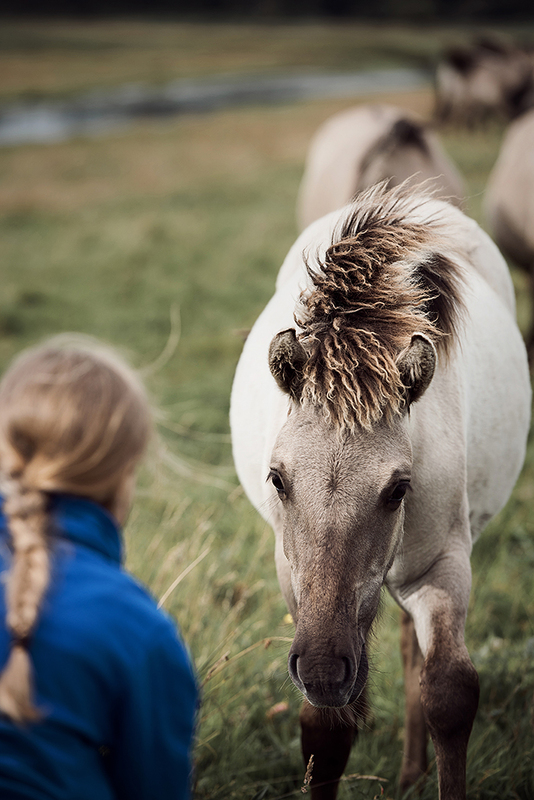 Our precious time with horses is frequently characterised by the “what” and “how” of specific action; We therefore are in an activity oriented mode, and we focus on terms like method, technique, and execution. Yet, I perceive a significant difference between focusing on doing something together and really engaging in the wonderful connection with another sentient being which might involve restraining myself sometimes to simply appreciate togetherness. 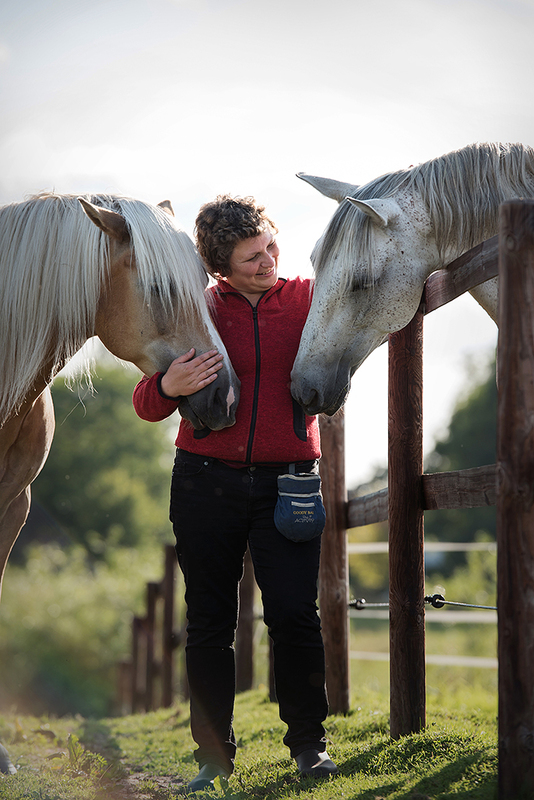 Our actions reflect our being to some extent, and so we can picture our ideas for spending time with horses as a form of personal expression. Positive reinforcement means much more to me than marking “correct” behavior in this process. I live the principle of positive exchange to please the horses, and to touch upon an emotional level of communication. The range of positive emotions is immense if we really think about it. We can enjoy moments of affection just like exuberant moments of extreme joy as well as relaxed tranquility. Tiny nuances are able to change the basic note of an emotion. 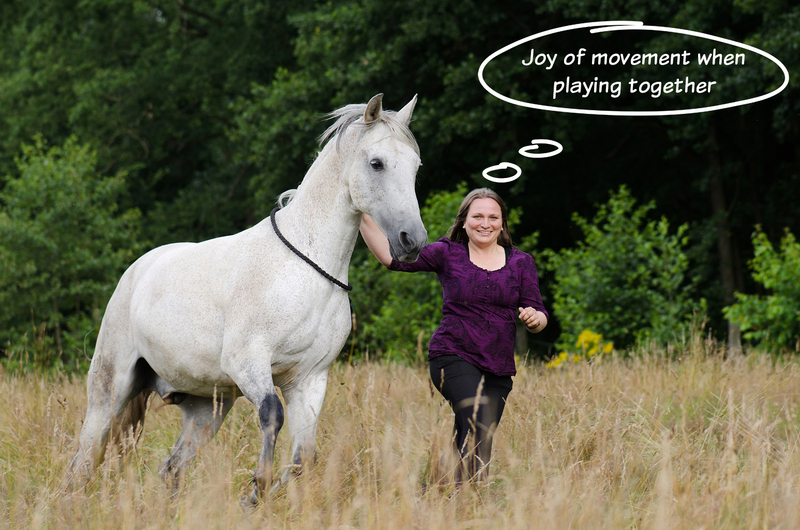 Horses posess an equivalent kind of joy, and they show it their way. A smile unfurls like a blossoming flower, becomes a laugh, and captures the whole body. 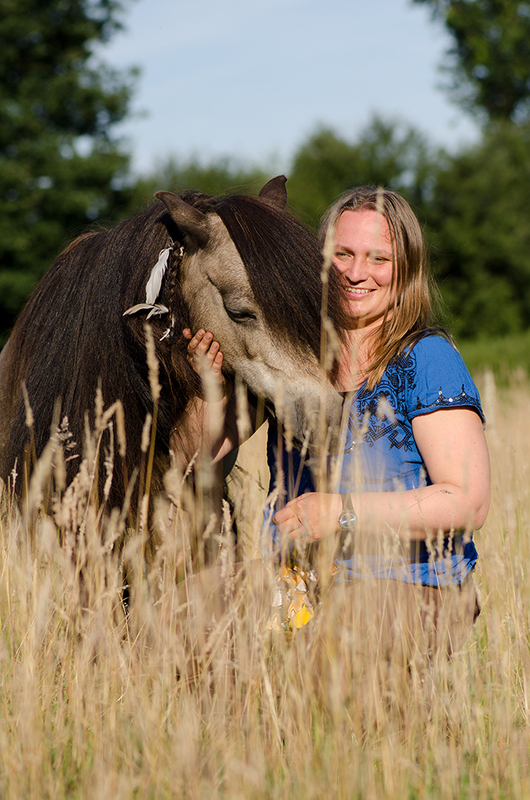 My work with horses aims to achieve that horses and humans can experience the full range of positive emotions, and that they are able to consciously activate all of them. All too often we ultimately only see one shared emotional state even among trainers who, in theory, focus on positive training; Among clicker trainers this is mostly focused attention or in other words some kind of highly motivated training mood. In principle, this is a beautiful emotional state, yet it is not the only one we might desire. So, this is not only about celebrating these states but also about discovering new ones. I want to be able to break into a running game, and I want to get lost in dreams. I want to show the animals that they are allowed to proudly move with us again but also how to play like foals. Classic training lessons are not an end in themselves. Eventually, they should serve as a kind of projection surface for us, or they can be a point of departure for our shared free development; They should bring joy, and inspire us. 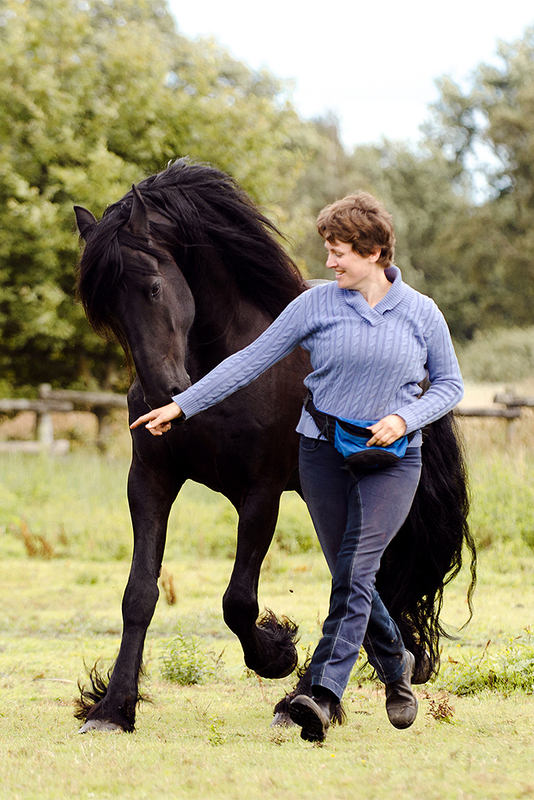 So, I do not want to achieve a well-trained, stereotypical, and frequently subliminal aggressive Spanish walk but I want my Spanish walk to be soft, proud, flexible, and playful so that there is room for the horse’s creative power in its performance. We use platforms or tree stumps so the horses can experience their external size first, and their internal size later. Or we use them to just enjoy the view. We are having an exuberant dialogue of movement in our running games. This enables me to communicate with the horse on this specific level, to bring our bodies in unison, and to sense and convey emotions. 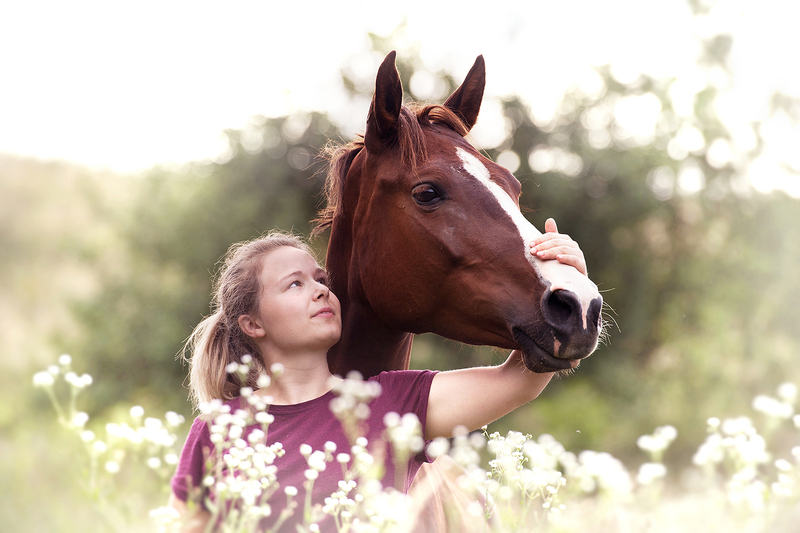 In my opinion, emotionally strong horses who have learned to experience the positive with their human being, and to share different sensations with him or her become ever more beautiful, and shine from within. Treats as rewards, or rewarding with one’s voice as well as affectionate touch are essential basics in training. Yet, training is not about the dull fullfilment of human desire but about the promotion of intrinsic motivation, or in other words, about the desire to harmoniously act from within, and to truly experience the moment. 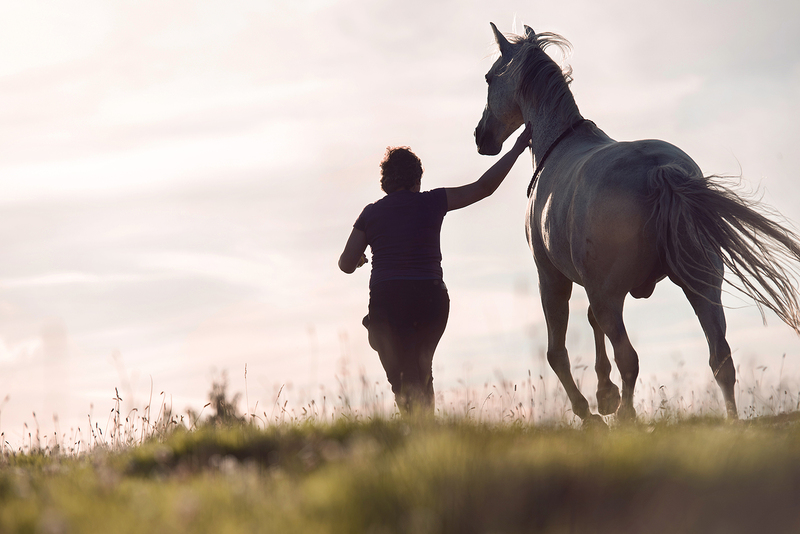 I go on an individual journey with every horse in order to discover the horse’s smile; We explore our emotional landscapes, share beautiful experiences, and curiously engage in the other’s otherness. The various points of contact of our similarities and our differences create an exciting exchange between two worlds. This makes communication with horses so interesting, again and again. 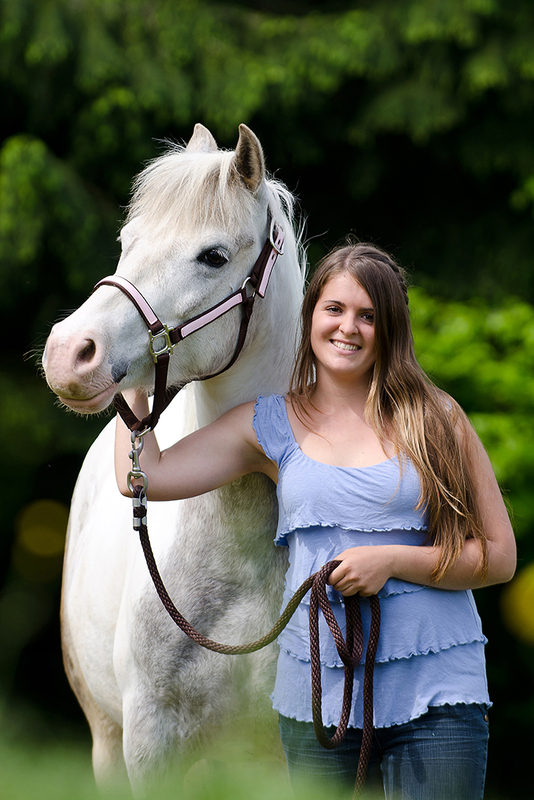 Being perceived creates a strong emotional bond, and lets horses shine from within. We try to ignite many shared moments of joy here at RPlus. 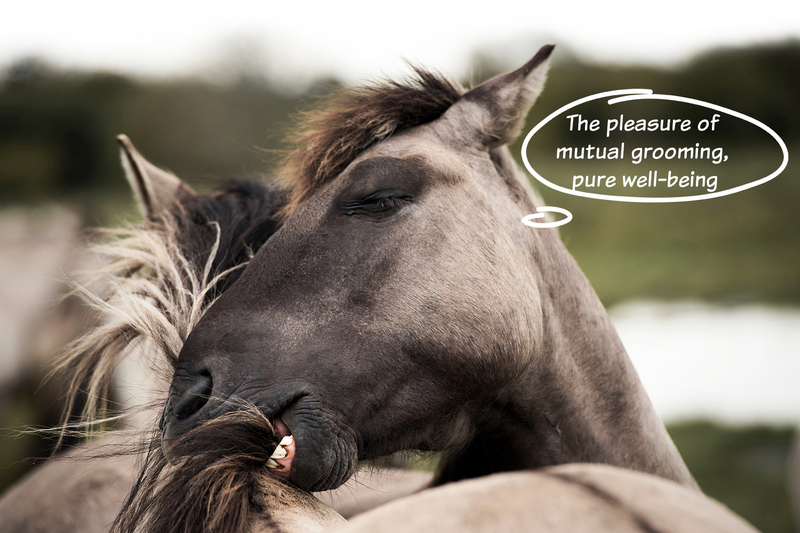 We aim to expand the initially narrow path of understanding each other, and we take the horses’ smile as beacon to guide our quest to discover a horse-appropriate way of being together with these fantastic creatures.